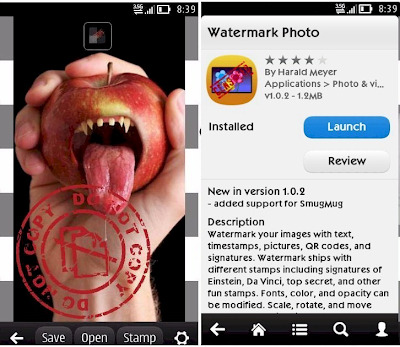 Watermark is one great application for you to have fun or professional image editing post. You only need to choose one photo that you want to "seal". Then you can select four different types of seals. + Or you can select one picture collection is available in a seal (as during the more beautiful images). + You can write letters to seal. The program supports color options, multiple fonts, rotated to small along any diagonal. + The program also supports you to create a seal for QR code image encoding novel unique. The program also many interesting things like sending photos through social networking .... waiting for you to discover, learn more.